Médecins Sans Frontières MSF (Doctors Without Borders) stops diagnosing Chagas disease in Paraguay due to treatment shortage. In Bolivia, new projects in endemic areas are suspended. Thousands of people with Chagas disease will go untreated in coming months due to a shortage of benznidazole, the first-line drug used in most endemic countries. As a number of countries are actively seeking to reverse the long neglect of Chagas disease, the supply of this treatment threatens to run out. Therefore, the medical-humanitarian organisation MSF is urging the Brazilian Ministry of Health, which is responsible for the only laboratory in the world manufacturing benznidazole, to respect its commitment to Chagas patients and take immediate measures to make the drug available. Chagas treatment currently depends wholly on a single pharmaceutical company to produce benznidazole tablets, the Brazilian State laboratory LAFEPE (Laboratorio Farmaceutico do Estado de Pernambuco). Responsibility for producing the active pharmaceutical ingredient (API) used by this laboratory was recently transferred to one sole private company, Nortec Química. There is not enough API at present to produce the tablets needed, and Nortec has yet to validate production. In addition, LAFEPE has breached its promise to publish and fulfil a manufacturing schedule that would ensure availability of the drug. As a result, various national Chagas programmes in Latin America are already struggling to meet the demand for new treatment and are expected to run out of stock in the next few months. No information has been provided by the Brazilian Ministry of Health on what is happening, and the World Health Organization (WHO) and the Pan American Health Organization (PAHO) have not put a contingency plan in place to maintain stocks of this drug for acute cases of Chagas. Future availability of the drug is not currently known, although according to various estimations it is unlikely to be before mid-2012. “This situation is unacceptable. In Boquerón, an area with one of the highest rates of Chagas in Paraguay, we are forced to stop diagnosing patients because we simply don’t have the drugs to treat them,” explains Dr Henry Rodríguez, MSF’s head of mission in Bolivia and Paraguay. In recent years, demand for treatment has increased significantly because adults are now being treated as well as children. 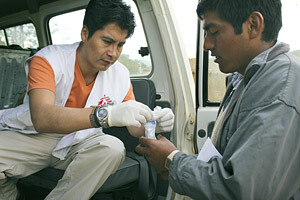 Besides, the WHO and the PAHO have strongly endorsed diagnosis and treatment at the primary healthcare level. However, all progress made to date is now jeopardised by the shortage of benznidazole. “Although we know that current treatment is more effective and more likely to prevent complications the sooner a patient is treated, we will be forced to delay it,” says Dr Unni Karunakara, MSF's international president.